At the end of June, a huge American flag held aloft by a pair of construction cranes peered out over an empty plot of land outside the Wisconsin town of Mount Pleasant. 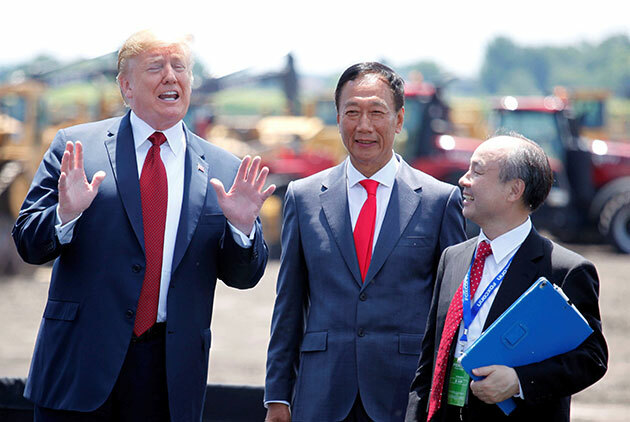 That formed the backdrop for a groundbreaking ceremony on June 28 at 1:30 p.m., when U.S. President Donald Trump and Foxconn Chairman Terry Gou dug up ground in perfect sync, symbolizing the start of the Wisconn Valley Science and Technology Park. It was the second time the two men appeared together, the first time coming at the White House in July 2017 when Gou announced his intention to invest billions of U.S. dollars in Wisconsin in America’s first LCD flat panel compound that would generate an estimated 13,000 jobs. “Over the past year, I have seen President Trump a few times. He has told me three things: work, work, work,” Gou said. Trump, he explained, has made creating jobs a major priority, and Foxconn is committed to creating high-tech, high-paying, high-potential and high-value jobs in Wisconsin. “To Silicon Valley, to Boston, Wisconn Valley is coming,” Gou declared. In a speech that lasted over half an hour and followed remarks by Wisconsin Governor Scott Walker, House Speaker Paul Ryan and Gou, Trump was high on the future of Foxconn’s investment. On the eve of the groundbreaking ceremony, over 40 groups launched the “Shake the Ground” campaign in preparation of a rally to oppose Foxconn breaking ground on the site. The groups contended that local officials have not listened to people’s concerns that the project could adversely affect Lake Michigan’s ecosystem and have no way of ensuring that the company’s project will be done properly. But those expressions of concern seemed to be drowned out by local governments’ thirst for jobs and economic growth. Foxconn, known in Taiwan as Hon Hai Precision Industry Co., said in a previous press release that the Wisconn Valley Science and Technology Park will occupy 1,000 acres and become one of the North America’s biggest and most important commercial parks. The campus will include America’s first TFT-LCD (thin-film-transistor liquid-crystal display) production facility and flat panel plant. It will also promote research in advanced technologies in areas such as artificial intelligence, big data, the Internet of Things, robotics, and automation, and bring together partners and suppliers from around the globe and create 13,000 high value jobs, Foxconn said. How Much Is Gou Willing to Lose? 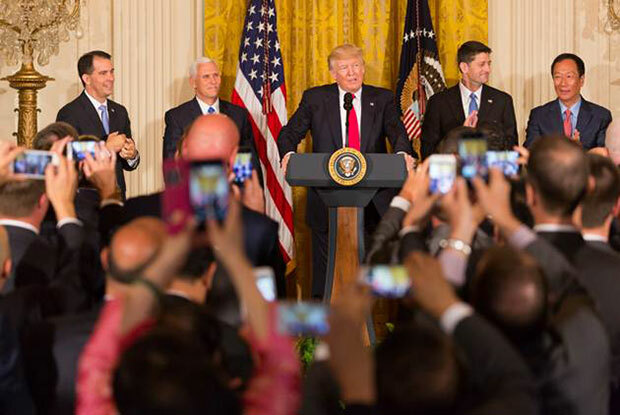 The US$10 billion investment over four years in the Wisconsin flat panel plant announced by Gou at the White House in July 2017 represents an important part of the AI 8K + 5G ecosystem the Foxconn Group is building as part of its transformation away from its core electronics contracting business into higher-margin businesses. The “Eagle Flies!” Gou declared at the time, clearly in high spirits as the first Taiwanese businessman to speak at the White House. On the same occasion, Trump described Gou as a friend, as one of the great businessmen anywhere in the world, and one of the great entrepreneurs of the world. The announcement gave rise to a “bring back Made in the USA” wave and resonated as a major economic achievement for Trump. But Harvard Business School professor Willy Shih, long a champion of “Made in America” and an expert on tech businesses in Greater China, sounded a pessimistic note on Gou’s Wisconsin project in a telephone interview with CommonWealth Magazine. Hon Hai’s deep pockets mean it can finish building the complex, Shih said, but the question would be how much money it is willing to lose to get the factory up and running. That’s because the flat panel factory Hon Hai wants to set up in the United States needs everything from materials and components to equipment – in essence it has to build a completely new supply chain, and it also needs a large number of mechanical engineers, Shih said. All of that needs time, and even before the plant is built, China’s new flat panel capacity will come on line, so every additional day the plant is not ready, it could cost Foxconn huge amounts of money, he said. The Wall Street Journal said the incentives may actually reach US$4.5 billion, but that even before the ballooning of costs, Wisconsin was not expected to recoup its Foxconn investment for 25 years. Foxconn has also gradually adjusted its parameters for the project after weighing the establishment of the factory complex and market realities. In presenting the project last year, Foxconn said it would build North America’s only 10.5-generation flat panel facility, but that later evolved into a manufacturing campus, with speculation widespread that the production lines would be reduced to 6th- or 8.5- generation production lines making smaller sized screens. Japanese business media Nikkei reported in May that the Wisconsin complex was switching to small and medium-sized panels because building a supply chain for large panels would take too much time and that materials for smaller panels could be imported from abroad. Nikkei reported that Foxconn could actually bring in some equipment in from similar Sharp flat panel plants in Kameyama to reduce the plant’s financial burden. The Sharp complex in Kameyama features a 6th-generation plant (K1) that uses LTPS technology to make small screens used in smartphones and an 8th-generation plant that uses IGZO technology for screens used in LCD TVs. “The equipment on the 6th-generation flat panel lines of Japan’s Sharp and Taiwan’s Innolux have been fully amortized and depreciated and can be directly shipped to the Wisconsin plant,” says David Hsieh, senior director for display research at information provider IHS Markit. Sharp and Innolux are both subsidiaries of the Foxconn Group. The Gen6 panels made in the two locations supply the automotive, smartphone and industrial markets, which could be a good fit because Wisconsin is not too far away from Detroit, America’s automotive hub. Automotive panels command relatively high prices and they would have considerable value being produced in the United States. In the 10.5-generation large-sized panel market, on the other hand, supply will exceed demand once BOE Technology Group’s new factory in China enters mass production, and pricing in the already competitive market will be even more cutthroat. Also, because all of the materials, substrates and equipment used to produce large panels are in Asia, manufacturing 65-inch LCD TVs in the United States would cost 50 to 80 percent more than in China or Taiwan. Betting on Both China and the U.S.
Based on the current American import duty of 15 percent for TVs and flat panels, “it makes more sense to import the panels and assemble the TVs [in the U.S.],” Hsieh contends. Sources indicate that Foxconn is also planning a facility on the Wisconsin campus to assemble 2 million to 3 million LCD TVs a year, though the question is for which brand? After the conclusion of Innolux’s shareholders meeting on June 19, Innolux and Foxconn separately announced they were buying stakes in Vizio, one of the top three LCD TV brands in North America, bringing the Foxconn Technology Group’s holdings to more than 13 percent of Vizio shares. Vizio sells 7 million to 8 million TVs a year in the North American market. “Hon Hai is planning this assembly line mainly for Vizio production. In the future, it will import the glass substrate from overseas, and then assemble the backlight modules, complete TV sets, transformers and TV brackets in Wisconsin, enabling it to fulfill its commitment to create jobs,” says a Taiwanese flat panel executive. That will lead, he says, to the emergence of a “Made in Wisconsin” North American TV brand. As it stands, the Wisconn Valley Science and Technology Park will not only consist of flat panel and television assembly facilities but also have research centers focused on autonomous vehicles, artificial intelligence and smart manufacturing, a concept that seems to replicate Gou’s 10.5-Generation flat panel complex sprouting up in the village of Zengcheng in Guangzhou, China. “Terry Gou knows that when it comes to China and the U.S., he can’t focus on just one side. He needs to be in both places,” says a president of a flat panel business. “Forget about the political or economic implications. Based simply on commercial model and supply chain considerations, having another ‘logistic’ needed by many industries can drive a lot of local economic activity. Of course, it takes a little longer to build up a supply chain,” Miao said, speaking from experience. His group’s Synnex has been in the United States for a long time and even listed there. At the Wisconsin facility’s groundbreaking ceremony, Gou told the story of how he got his “first break as a young businessman” in 1974 when he received his first order – from Chicago-based TV manufacturer Zenith. Gou said that without that order, he would not be who he is today. Gou has already purchased a building in Milwaukee to serve as his North American headquarters. But just as with the many variables and uncertainties surrounding Trump’s gambit to address China’s predatory trade practices, it remains unclear whether the flat panel plant scheduled to be completed in Wisconsin in 2020 will create new growth momentum for the Foxconn empire or grow into a major operational burden.